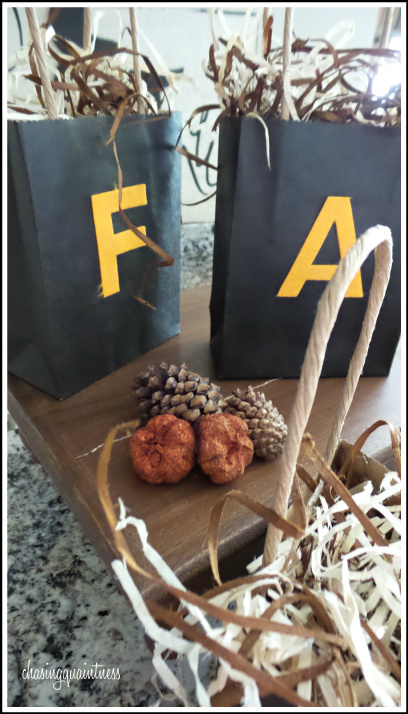 As I was going through all of my home décor preparing for the Fall Home Tour last week, I came across these cute little bags. By the way, I hope you all enjoyed the Fall Home Tour hosted by Brenda at Cozy Little House! I thoroughly enjoyed looking at all of the beautiful homes and seeing all of the different styles of décor. I’ve been working on getting more rooms in the new house completed and hope to be able to show those to you before too long. Okay, so back to the project. I don’t have the step-by-step photos to show you because I made this a few years ago. Even after all of our moves, they are still in great shape. I purchased 4 small black craft bags. These can be found at Michael’s or Hobby Lobby in any size and any color. I chose black. I also purchased a bag of felt letters and some gift basket stuffing, shredded. 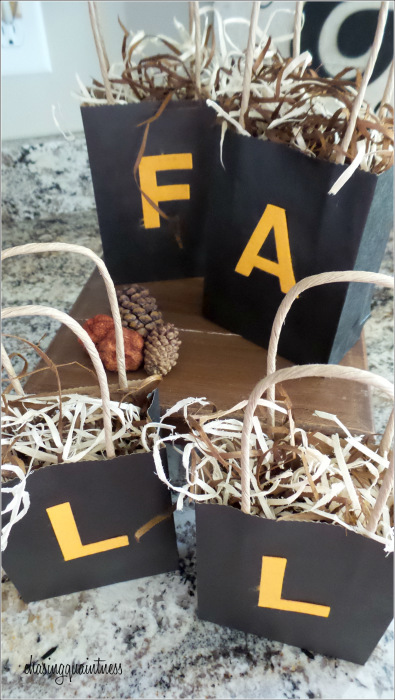 I used plain Elmer’s to glue the letters on the bags. After the letters were dried, I used the shredded paper to stuff the bags. That’s all there was to it. I have some cute little fall décor that can be used literally anywhere and it took less than 15 minutes to make. The supplies were inexpensive and I had letters and stuffing left over for another project! Me also Tessa! I have to keep my craft projects on the low-key end or else they just become a big mess...LOL Hugs!! See, you can "do" a craft! Is there a possibility you can increase your font size? I have a hard time reading it. Yes, you could fill them with anything! LOL....I'm working on trying to improve my craft skills...I found a Pottery Barn Knock-off pumpkin I want to try...it only requires a little bit of paint...so we will see! LOL Thanks so much girl! Hope you are having a great Monday! Hugs!! Very cute! You can make a banner the same way too! I have to stick with the easy stuff so this is good for me! Thank you ma'am! I may have to give a matching banner a try, especially since I can't put anything on top of the mantel due to the TV being mounted on the way! Easy stuff works best for me also! Cute. A+++ for a craft success! Thank you so much! I was excited…LOL It’s the little things. LOL...I know, it was such a shock wasn't it??!! :-) I'm going to try a couple of other ideas this weekend, hopefully! OMGOSH...those are too awesome!!! You will have to send me photos once you get it done. I just loved that and have now pinned it to my DIY board....amazing! And "mums" the word on the stick...LOL!! I know Judith, who'd a thunk it, right??!! HA...that's so true!! Love these so cute and seem pretty easy. My kind of craft project. Thanks for sharing. You too Tessa! The Autumn Equinox always falls on my birthday, so it's usually a double celebration! :-) Love and hugs to you my sweet friend! LMAO...you crack me up!! These are easy and I do not normally do craft projects either, since I usually fail miserably at my attempts. This was one of my better days and super easy! :-) I'm definitely a stick person also...much love and hugs!! Very cute! And you say that you can't craft well.... pffft! Thank you so much! This was a 1 on my KDS, so it was worth the try…LOL. Believe it or not, we have been taking it a little bit easier. Some family issues have come up and I’ve had to focus on those things instead of unpacking boxes, so we are chilling on the house at the moment! My body is forcing me to slow down, whether I wanted to or not….sometimes it knows best! :-) Much love to you!! Hugs!! These are darling, Benita! They just feel welcoming. Windows open here, AC off. Isn't it wonderful? I could take a couple of months of it just staying this way, maybe a tad cooler. Thank you so much! They were easy and that works for me!! YES, the weather is so wonderful and I can't wait until the temps drop even more!! Love to you and hope you are feeling better!! Great idea!! Easy and just right for an Autumn touch. 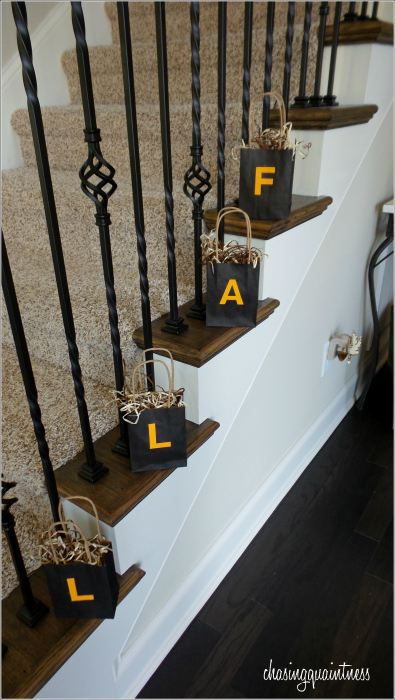 Great idea, Benita and so cute on your stairs! LOL...I'm so glad I could be of help! :-) Thank you so much! Since they are so light weight, they could probably also be hung across a mantel on a small piece of rope or something and clipped with cute little clips! I do like your wall peg idea....that's giving me an idea as well....we are definitely in trouble! :-) Post what you do....or send me photos! :-) Hugs!! LOL...you are too funny!! Thanks so much...I have to do the easy stuff...nothing complicated here! Yeah, kids are the issue, as are animals...they think it's something to disassemble! And yes, you would! Hugs!! So cute! I'd have to find a high place to put them since the kids would think they are birthday presents,lol.